Ruth Crawford was born to an itinerant Methodist minister and his wife. The family resided in Jacksonville, Florida when Crawford’s father died in 1914. Upon graduating high school Crawford entered Foster’s School of Musical Art, studying piano. The Foster School relocated to Miami in 1921, and Crawford enrolled in the American Conservatory of Music in Chicago. Originally planning to take a one-year teaching certificate in piano, she stayed until 1929, studying composition and theory with Adolf Weidig. Weidig encouraged her early efforts, and with her first Piano Preludes of 1924 Crawford had already developed her own unique, “ultra-modern” voice. In 1926 Crawford composed her Sonata for Violin and Piano, performed often at modern music concerts in the late twenties; critics remarked that Crawford could “sling dissonances like a man”. She was recognized early on as a woman composer who did not fit the sentimental stereotypes associated with the standard profile. In Chicago, Crawford joined the circle of Djana Lavoie Herz, pianist and ex-follower of Scriabin; through Herz she met Dane Rudyhar, Henry Cowell and pianist Richard BŸhlig. Cowell quickly enjoined Crawford’s cause, arranging for performances of her music in New York and publishing it in the periodical New Music Quarterly. Crawford worked as a piano teacher for the children of poet Carl Sandburg; it was he who first interested her in American folksongs. She contributed arrangements to his 1927 book The American Songbag, and later created significant original settings to eight of his poems. By 1930, Ruth Crawford was a force to be reckoned with in American modernism. Stylistically her work stood out in its uncompromising use of dissonance, contrapuntal ostinati, striking choice of texts and tidy formal construction. In March 1930 Crawford won a Guggenheim Fellowship to travel to Europe; the first woman so honored. In Berlin Crawford composed “Three Chants” set to a wordless text for women’s chorus; this eerie, experimental work has no obvious parallels to any music written before the 1960s. The following year witnessed her most famous work, String Quartet 1931, and with its publication Crawford provided the definitive foil to the old maxim that women “just can’t write” classical music with the strength and seriousness of male composers. In 1929 she began study with Charles Seeger, a key figure in American music as a composer, theorist and musicologist. They married in 1932, with Ruth assuming responsibility for his children of a previous marriage, including son Pete, soon to become America’s best known folksinger. She likewise adopted several of Seeger’s theoretical methods that mark the works of her most productive period, 1930-33, however, her composing comes to a virtual standstill after 1934. Among her children with Seeger were daughter Peggy and son Mike, both to become renowned folksingers and teachers in adulthood. In 1936 the Seegers moved to Washington, D.C. to work in folksong collecting for the Library of Congress. Crawford acted as transcriber for the book Our Singing Country and, with Charles Seeger, Folk Song USA, both authored by John and Alan Lomax. As Ruth Crawford Seeger she published her own pioneering collection, American Folk Songs for Children, in 1948, designed for use in elementary grades. This and the other “Crawford Seeger” books of the kind are yet regarded as key texts in primary music education, and were widely adopted and imitated in the field. 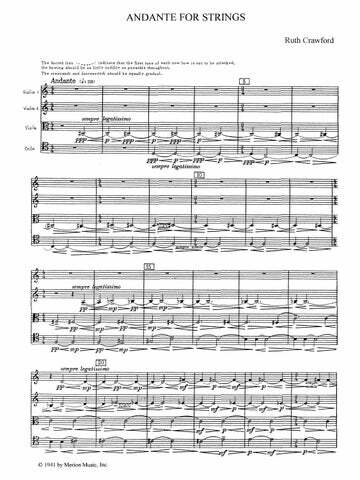 Crawford only returned to serious composition with the Suite for Wind Quintet in 1952. By the time it was completed, she learned she had cancer and Ruth Crawford died at the age of 52, ending prematurely a career that had begun with extraordinary promise. 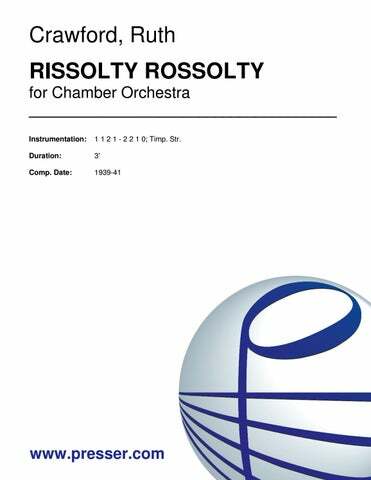 for Contralto, Oboe, Percussion and Piano, with or without an Orchestral Ostinato 8:30 Cont. Ob. Perc. Pno. soli; 0 0 1 1 – 1 1 1 0; Str. for Strings from String Quartet 1931 3:30 Str. 3:00 1 1 2 1 – 2 2 1 0; Timp. Str.